TsukiMoon makes the night sky brighter. My ordinary life grew because of our extraordinary ASD son. Continuing with the train theme: TsukiMoon asked this morning what dementors are. I said, "read the book." He responds with, "I did. It doesn't explain them." "Read all the books, then you might get a better idea," I say. This conversation prompted me to draw the train from the Harry Potter movies. I have always thought it was a beautiful train. 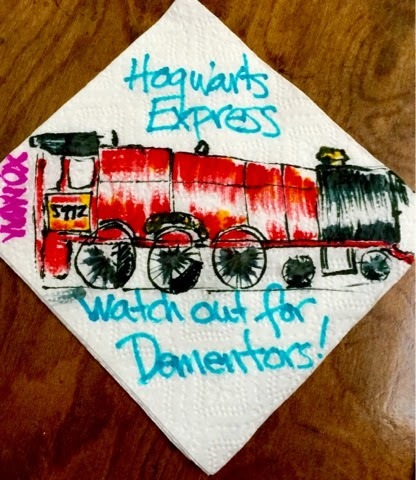 It was fun to create this napkin today. Movie Therapy-- "The Imitation Game"